…Do we have anything to endure? In this no one is lacking. Everyone’s arena of endurance is vast, and therefore our salvation is at hand. Endure everything to the end and you will be saved. However, you must endure skillfully – otherwise you may not gain anything by your endurance. First of all, keep the Holy Faith and lead an irreproachable life according to the Faith. Immediately cleanse with repentance every sin that occurs. Second, accept everything that you must endure from the hands of God, remembering firmly that nothing happens without God’s will. Third, give sincere thanks to God for everything, believing that everything which proceeds from the Lord is sent by Him for the good of our souls. Thank Him for sorrows and consolations. Fourth, love sorrow for the sake of its great salvific power, and cultivate within yourself a thirst for it as for a drink which, although bitter, is healing. Fifth, keep in your thoughts that when misfortune comes, you cannot throw it off like a tight-fitting garment; you must bear it. Whether in a Christian way or in a non-Christian way, you cannot avoid bearing it; so it is better to bear it in a Christian way. Complaining will not deliver you from misfortune, but only make it heavier; whereas humble submission to God’s Providence and a good attitude relieve the burden of misfortunes. Sixth, realize that you deserve even greater misfortune. Recognize that if the Lord wanted to deal with you as you rightly deserve, would He have sent you such a small misfortune? Seventh, above all, pray, and the merciful Lord will give you strength of spirit. With such strength, when others marvel at your misfortunes, they will seem like nothing to you. Now there we have a handy to-do list to print out and put on the refrigerator! St. Theophan makes several points here, but I should like to expand on three: That we all have something to endure and therefore our salvation is at hand, that we actually deserve greater misfortunes than those which we receive, and that above all we must pray. “…therefore our salvation is at hand.” The spiritual struggler will lose hope if he sees this life as a dark tunnel with no end in sight. The devil would certainly like for us to see it this way. But this is an illusion. When one thinks of the thousands of years since the Creation, and all the human generations before us, and the illimitable expanse of the aeons of the invisible universe inhabited by the angels, and the endless joy of the saints in heaven…one realizes that one is a very little person after all, that this life is short, and that all that matters is whether we please God in our short trial or not. This life is a sprint, not a marathon. Soon all will be over here, and our real life – or real sufferings – will start there. Is it not worth our while to endure for this short time? “…realize that you deserve even greater misfortune.” St. Ignaty Brianchaninov, in The Arena, is more explicit: One should realize that one deserves every temporal and eternal punishment. Why is this? It is because the infinitely holy and good God has lavished His love on us, but we sin against Him. What misfortune would be sufficient to punish such ingratitude? But the Lord does not visit such misfortune upon us – nothing we suffer is commensurate with what we deserve. The proud human mind says that this teaching is a false image of a cruel god. The humble mind realizes that this is very Good News indeed, for it signifies that God desires our salvation, and that the misfortunes He sends us are not only for the retribution that we justly deserve because of our sins, but also for the cleansing of our souls from our sins, for our salvation, because He wants us to be with Him once more in Paradise. He desires our salvation more than we do. 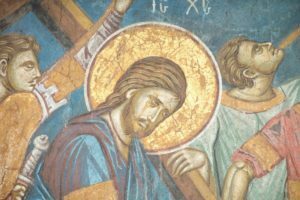 “…above all, pray…” The time of misfortune is actually the most opportune time for prayer, because it is a crisis, a moment of judgment, when we either go more deeply into prayer or we run away from God into illusory solutions to our predicament. When we do turn to God in great pain of heart, in the midst of suffering, our prayer deepens, we feel His presence, and we understand that we are made not for this life but for another world, that our home is not here but there, and this thought becomes the source of inexhaustible consolation. Prayer changes from being an interruption to our supposedly real life to the content of our really real life. We start praying more frequently, even constantly, and with greater fervor and attention. This in turn gives us greater strength to endure the present misfortune and those yet to come.